Did you know that October is the month with the most pet adoptions? We are happy to help you find your next 4-legged best friend. Drop by this Saturday, October 14th, between noon and 3 PM and meet our newest arrivals! Other pups, both large and small, will be here along with their foster parents. Don’t miss the fun! Thinking of adopting a puppy? Talk to their Adopt-A-Pet foster parents and learn about these puppies and their personalities, and what we know about their histories. Considering fostering? Come talk to these pups’ foster parents, and see what it’s like to have a four-legged foster child, or 3! 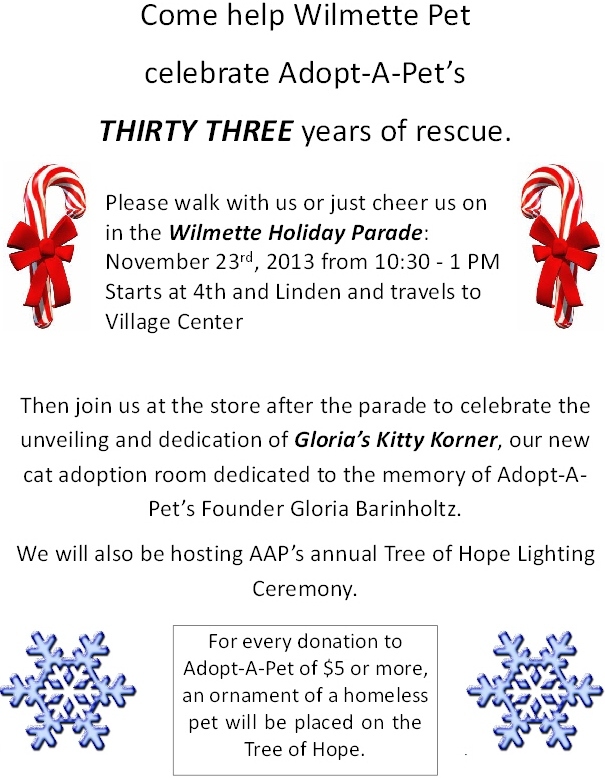 Make a financial donation to support Wilmette Pet’s rescue partner Adopt-A-Pet. Unfortunately, not all puppies arrive in healthy, ready to adopt condition. Some require hospitalization and thousands of dollars of medical care; some require several treatments to get rid of ringworm or other skin conditions. All require routine puppy immunizations and spay or neuter surgery. 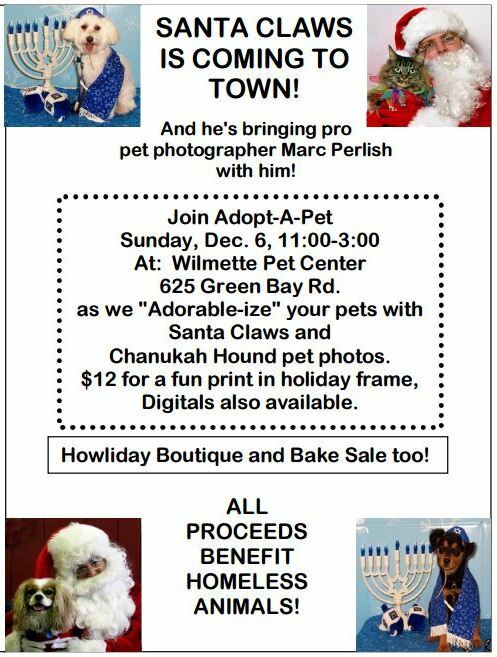 Adopt-A-Pet is an all-volunteer rescue organization and 100% of your donation is used to care for their animals (not for salaries or buildings). Consider becoming a volunteer dog walker! If you like dogs and like walking, this program is for you! Make your own schedule . . . daily, weekly or monthly. To volunteer, just attend a one-hour Dog-Walking Orientation at Wilmette Pet Center. Orientations are set up on an as-needed basis. Email Sophie at: sophieamphlett@yahoo.com to set up an orientation for yourself. Sheba, a wire-haired terrier/Shepherd mix, about 10 months old and 35 pounds, she is very playful and a very nice medium-size. Shalimar, a 38 pound 12 month old pup who acts like a lab but looks like a miniature Rottweiler. And remember, when you adopt any dog, whether they are fostered here or elsewhere, come in with your paperwork to receive our New Puppy coupon book. It’s filled with tons of coupons to save you time and money, with an educated staff to get you started right! Thanks in advance for your support as we work with Adopt-A-Pet to find these pups their forever families!